Humana Fundación Pueblo para Pueblo promotes since 1987 environmental protection and has carried out cooperation projects in various countries in sub-Saharan Africa, South America, and Asia. The projects' common goals are to promote training, education, and the development of the beneficiary communities. Through textile reusing, we support our projects and protect the environment. Humana Fundación Pueblo para Pueblo is registered in the Ministry of Education, Culture and Sports with number 08-0347. Humana Fundación Pueblo para Pueblo is part of the Federation for Associations connected to the International Humana People to People Movement. 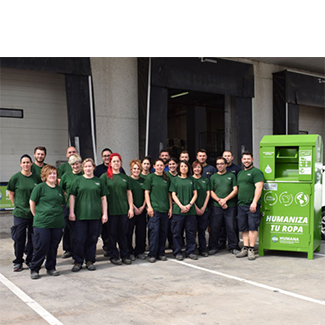 We are also a member of the Spanish Global Compact Network, Asociación Española de Fundaciones, Federación Española de la Recuperación y el Reciclaje and the Coordinator of Foundations in Catalonia. The foundation also has ISO 9001 and ISO 14001. Among our values are development aid, social responsibility, commitment to the environment, sustainability, solidarity, transparency, integrity, and independence.